One of the most significant ways Lupe aided the community of Monmouth was through her work at Farmland Foods in the early 1990s. For over five years, Lupe served as a volunteer translator and interpreter, on an as-needed basis, collaborating with the company to improve the orientation experience, workers' physicals and paperwork completion process for the large number of Farmland's Hispanic employees. Michelle Reyburn, the Human Resource Manager at Farmland Foods, spoke of Lupe's incredible energy during her involvement with Farmland Foods: "There she was, at 70 some years old, and you would have never been able to guess how old she was," she said, adding "She had energy that I hope to have when I'm that age!" It was this energy that Reyburn believes allowed Lupe to help several hundred individuals at Farmland over the duration of her four years volunteering at Farmland. 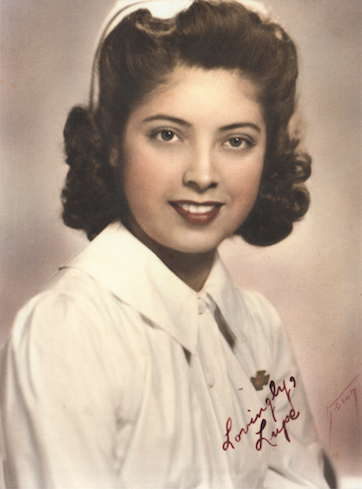 Although many people in Monmouth were aware of Lupe's volunteerism through Farmland, she remained humble her impact on the community. Susan Twomey says of Lupe's involvement that she was a pillar in the community, helping people quietly and with a great deal of respect. 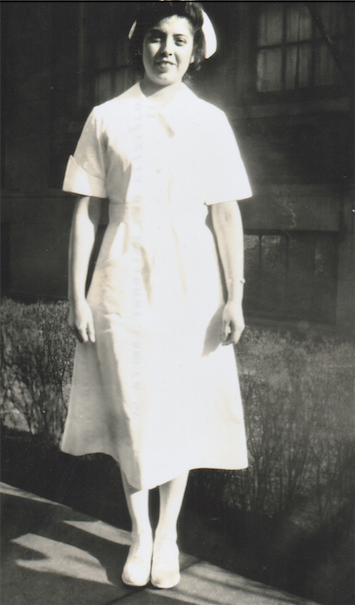 Lupe in her nurse's uniform. Michelle Reyburn, Human Resource Manager at Farmland Foods, discusses Lupe's impact on the community. Michelle Reyburn shares details about Lupe's community participation.